A very long time ago, in mid winter, when the snowflakes were falling like feathers from heaven, a beautiful queen sat sewing at her window, which had a frame of black ebony. As she worked, she looked sometimes at the falling snow, and it happened that she pricked her finger with her needle, so that three drops of blood fell upon the snow. How pretty the red blood looked upon the dazzling white! The Queen said to herself as she looked it, “Ah me! If only I had a dear little child who had skin as white as the snow, lips as rosy as the blood, and hair as black as the ebony window frame.” Soon afterwards she had a little daughter, with skin white as snow, lips rosy as blood, and hair as black as ebony– and she was therefore called “Little Snow White.” But alas! When the little one was born, the good Queen died. A year passed away, and the King took another wife. She was a beautiful woman, but proud and haughty, and she could not bear that anyone else should surpass her in beauty. She had a mirror and when she stood in front of it and asked, “Mirror, mirror upon the wall, Who is the fairest of us all?” The mirror answered: “Thou, O Queen, art the fairest of all,” and the Queen was contented, because she knew the mirror could speak nothing but the truth. But as time passed on, Little Snow White grew more and more beautiful, until when she was seven years old, she was as lovely as the bright day, and still more lovely than the Queen herself, so that when the lady one day asked her mirror “Mirror, mirror upon the wall, Who is the fairest of us all?” it answered: “O Lady Queen, though fair ye be, Snow White is fairer far to see.” The Queen was shocked, and grew yellow and green with envy, and from that moment envy and pride grew in her heart like rank weeds, so that she had no peace day or night, until one day she called a huntsman and said “Take the child away into the woods and kill her, for I can no longer bear the sight of her. And when you return, bring with you her heart, that I may know you have obeyed my will.” The huntsman dared not disobey, and he led Snow White out into the woods and placed an arrow in his bow to pierce her innocent heart, but the little girl cried and begged him saying, “Ah dear huntsman, leave me my life! I will run away into the wild forest, and never come home again.” And as she was so beautiful the huntsman had pity on her and said, “Run away, then, you poor child.” While to himself he thought, “The wild beasts will soon have devoured you,” and yet it seemed as if a stone had been rolled from his heart since he no longer had to to kill her. Then as a young wild boar came rushing by, he killed it, took out its heart, and carried it home to the Queen. The cook was ordered to prepare this, and the wicked Queen ate it, and thought she had eaten the heart of Snow White. Poor little Snow White was now all alone in the wild wood, and so frightened was she that she trembled at every leaf that rustled. Then she began to run, and ran over sharp stones and through thorns, and the wild beasts ran past her, but did her no harm. And she kept on running until she came to a little house, where she went in to rest. Inside the cottage, everything she saw was tiny, but more dainty and clean than words can tell. Upon a white-covered table stood seven little plates and upon each plate lay a little spoon, besides which there were seven knives and forks and seven little goblets. Against the wall, and side by side, stood seven little beds covered with perfectly white sheets. Snow White was so hungry and thirsty that she took a little food from each of the seven plates, and drank a few drops of wine from each goblet, for she did not wish to take everything away from one. Then, because she was so tired, she crept into one of the beds, but it did not suit her, and then she tried the others, but one was too long, another too short, and so on, until she came to the seventh, which suited her exactly; so she said her prayers and soon fell fast asleep. When night fell the masters of the little house came home. They were seven dwarfs, who worked with a pick axe and spade, searching for copper and gold in the heart of the mountains. They lit their seven candles and then saw that someone had been to visit them. The first said, “Who has been sitting on my chair?” The second said, “Who has been eating from my plate?” The third, “Who has taken a piece of my bread?” The fourth, “Who has taken some of my vegetables?” The fifth, “Who has been using my fork?” The sixth, “Who has been cutting with my knife?” The seventh, “Who has been drinking out of my goblet?” The first looked round and saw that his bed was rumpled, so he said, “Who has been getting into my bed?” Then the others looked round and each one cried, “Someone has been on my bed too” But the seventh, when he looked at his bed, saw little Snow White, who was lying asleep there. And he called the others, who came running up, and they cried out with astonishment, and brought their seven little candles and let the light fall on little Snow White. “Oh, heavens! oh, heavens!” cried they, “what a lovely child!” and they were so glad that they did not wake her up, but let her sleep on in the bed. And the seventh dwarf slept with his companions, one hour with each, and so got through the night. When the sun rose, Snow White awoke, and, oh! 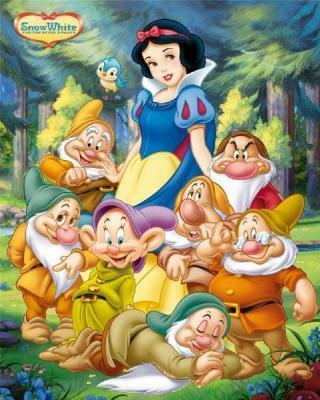 How frightened she was when she saw the seven little dwarfs. But they were very friendly, and asked what her name was. “My name is Snow White,” she answered. “And how did you come to get into our house?” asked the dwarfs. Then she told them how her cruel step-mother had intended her to be killed, but how the huntsman had spared her life and she had run on until she reached the little house. 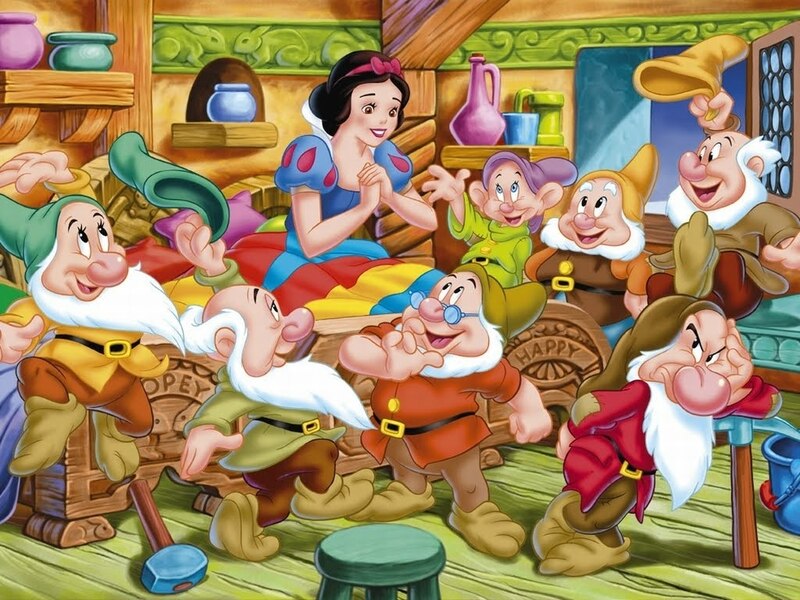 And the dwarfs said, “If you will take care of our house, cook for us, and make the beds, wash, mend, and knit, and keep everything neat and clean, then you may stay with us and you shall lack for nothing.” “Yes,” answered Snow White; “With all my heart,” and so she stayed. She kept the house neat and clean for the dwarfs, who went off early in the morning to search for copper and gold in the mountains, and who expected their meal to be standing ready for them when they returned at night. All day long Snow White was alone, and the good little dwarfs warned her to be careful to let no-one into the house. “For,” said they, “your step-mother will soon discover that you are living here.” The Queen, believing, of course, that Snow White was dead, and that she had eaten her heart, and that therefore she was again the most beautiful lady in the land, went to her mirror, and said: “Mirror, mirror upon the wall, Who is the fairest fair of all?” Then the mirror answered- “O Lady Queen, though fair ye be, Snow White is fairer far to see. Over the hills and far away, she dwells with seven dwarfs to-day.” How angry she was, for she knew that the mirror spoke the truth, and that the huntsman must have deceived her. She thought and thought how she might kill Snow White, for she knew she would have neither rest nor peace until she really was the most beautiful in the land. At length she decided what to do. She painted her face and dressed herself like an old pedlar-woman, so that no one could recognize her, and in this disguise she climbed the seven mountains that lay between her and the dwarves’ house, and knocked at their door and cried, “Pretty things to sell, very cheap, very cheap.” Snow White peeped from the window and said, “Good day, good wife, and what are your wares?” “All sorts of pretty things, my dear,” answered the woman. “Silken laces of every colour,” and she held up a bright-coloured one, made of plaited silks. “Surely I might let this honest old woman come in?” thought Snow White, and unbolted the door and bought the pretty lace. “Dear, dear, what a sight for sore eyes you are, child,” said the old woman; “Come, let me lace you properly for once.” Snow White had no suspicious thoughts, so she placed herself in front of the old woman that she might fasten her dress with the new silk lace. But immediately the wicked creature laced her bodice so tightly that she could not breathe, and fell down upon the ground as though she were dead. “Now,” said the Queen, “I am once more the most beautiful lady in the land,” and she went away. When the dwarfs came home they were very grieved to find their dear little Snow White lying upon the ground as though she were dead. They lifted her gently and, seeing that she was too tightly laced, they cut the silken cord, when she drew a long breath and then gradually came back to life. When the dwarfs heard all that had happened they said, “The pedlar-woman was certainly the wicked Queen. Now, take care in future that you open the door to none when we are not with you.” The wicked Queen had no sooner reached home than she went to her mirror, and said- “Mirror, mirror upon the wall, Who is the fairest fair of all?” And the mirror answered as before- “O Lady Queen, though fair ye be, Snow White is fairer far to see. Over the hills and far away, She dwells with seven dwarfs to-day.” The blood rushed to her face as she heard these words, for she knew that Snow White must have come to life again. “But I will manage to put an end to her yet,” she said, and then, by using witchcraft, she made a poisonous comb. Again she disguised herself, climbed the seven mountains, and knocked at the door of the seven dwarfs’ cottage, crying, “Pretty things to sell -very cheap today!” Snow-White looked out of the window and said, “Go away, good woman, for I dare not let you in.” Surely you can look at my goods,” answered the woman, and held up the poisonous comb, which pleased Snow White so well that she opened the door and bought it. “Come, let me comb your hair in the newest way,” said the woman, and the poor unsuspicious child let her have her way, but no sooner did the comb touch her hair than the poison began to work, and she fell fainting to the ground. “There, you model of beauty,” said the wicked woman, as she went away, “you are done for at last!” But fortunately it was almost time for the dwarfs to come home, and as soon as they came in and found Snow White lying upon the ground they guessed that her wicked step-mother had been there again, and set to work to find out what was wrong. They soon saw the poisonous comb, and drew it out of her hair, and almost immediately Snow White began to recover, and told them what had happened. Once more they warned her to be on her guard, and to open the door to no-one. When the Queen reached home, she went straight to the mirror and said: “Mirror, mirror on the wall, Who is the fairest fair of all?” And the mirror answered- “O Lady Queen, though fair ye be, Snow White is fairer far to see. Over the hills and far away, She dwells with seven dwarfs today.” When the Queen heard these words she shook with rage. “Snow White shall die,” she cried, “even if it costs me my own life!” She went into a secret chamber, where no one else ever entered, and there she made a poisonous apple, and then she painted her face and disguised herself as a peasant woman, and climbed the seven mountains and went to the dwarfs’ house. She knocked at the door. Snow White put her head out of the window, and said, “I must not let anyone in; the seven dwarfs have forbidden me to do so.” “It’s all the same to me,” answered the peasant woman; “I shall soon get rid of these fine apples. But before I go I’ll make you a present of one.” “Oh! No,” said Snow-White, “for I must not take it.” “Surely you are not afraid of poison?” said the woman. “See, I will cut one in two: the rosy cheek you shall take, and the white cheek I will eat myself.” Now, the apple had been so cleverly made that only the rose-cheeked side contained the poison. Snow White longed for the delicious-looking fruit, and when she saw that the woman ate half of it, she thought there could be no danger, and stretched out her hand and took the other part. But no sooner had she tasted it than she fell down dead. The wicked Queen laughed aloud with joy as she gazed at her. “White as snow, red as blood, black as ebony,” she said, “this time the dwarfs cannot awaken you.” And she went straight home and asked her mirror– “Mirror, mirror upon the wall, Who is the fairest fair of all?” And at length it answered– “Thou, O Queen, art fairest of all!” So her envious heart had peace -at least, as much as an envious heart can have peace. 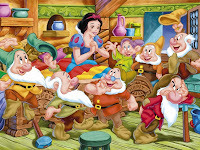 When the little dwarfs came home at night they found Snow White lying upon the ground. No breath came from her parted lips, for she was dead. They lifted her tenderly and sought for some poisonous object which might have caused the mischief, unlaced her frock, combed her hair, and washed her with wine and water, but all in vain -dead she was and dead she remained. They laid her upon a bier, and all seven of them sat round about it, and wept as though their hearts would break, for three whole days. When the time came that she should be laid in the ground they could not bear to part from her. Her pretty cheeks were still rosy red, and she looked just as though she were still living. “We cannot hide her away in the dark earth,” said the dwarfs, and so they made a transparent coffin of shining glass, and laid her in it, and wrote her name upon it in letters of gold; and that she was a King’s daughter. Then they put the coffin out upon the mountain top, and one of them always stayed by it and watched it. And birds came too, and wept for Snow White; first an owl, then a raven, and last a dove. For a long, long time little Snow White lay in the coffin, but she did not change; she only looked as though she slept, for she was still as white as snow, as red as blood, and as black as ebony. It chanced that a King’s son came into the wood, and went to the dwarfs’ house, meaning to spend the night there. He saw the coffin upon the mountain top, with little Snow White lying within it, and he read the words that were written upon it in letters of gold. And he said to the dwarfs, “If you will but let me have the coffin, you may ask of me what you will, and I will give it to you.” But the dwarfs answered, “We would not sell it for all the gold in the world.” Then said the Prince, “Let me have it as a gift, I pray you, for I cannot live without seeing little Snow White, and I will prize your gift as the dearest of my possessions.” The good little dwarfs pitied him when they heard these words, and so gave him the coffin. The King’s son then bade his servants place it upon their shoulders and carry it away, but as they went they stumbled over the stump of a tree, and the violent shaking shook the piece of poisonous apple which had lodged in Snow White’s throat out again, so that she opened her eyes, raised the lid of the coffin, and sat up, alive once more. “Where am I?” she cried, and the happy Prince answered, “Thou art with me, dearest.” Then he told her all that had happened, and how he loved her better than the whole world, and begged her to go with him to his father’s palace and be his wife. Snow White agreed, and went with him, and the wedding was celebrated with great splendour and magnificence. Little Snow White’s wicked step-mother was invited to the feast, and when she had dressed herself in her most beautiful clothes, she stood before her mirror, and said: “Mirror, mirror upon the wall, Who is the fairest fair of all?” And the mirror answered– “O Lady Queen, though fair ye be, The young Queen is fairer to see.” Oh! How angry the wicked woman was then, and so terrified, too, that she scarcely knew what to do. At first she thought she would not go to the wedding at all, but then she felt that she could not rest until she had seen the young Queen. No sooner did she enter the palace than she recognized little Snow White, and could not move for terror. Then a pair of red-hot iron shoes was brought into the room with tongs and set before her, and these she was forced to put on and to dance in them until she could dance no longer, but fell down dead, and that was the end of the wicked Queen.